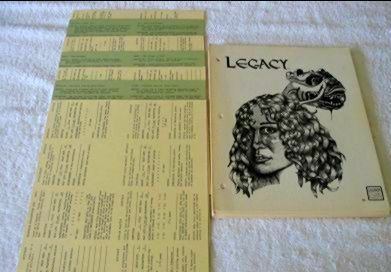 Notes on Legacy (David Feldt, 1978) – Is it the F.A.T.A.L. of 1978? The Legacy RPG by David A. Feldt was self-published in 1978. It is an odd, but weirdly fascinating, duck. It’s unplayable (because it is barely understandable), but when you read it you will be drawn to some of its weird ideas and want to implement something like them in your game. Unfortunately, I never could get any of them to work. The game itself is a collection of loose leaf pages, looks like it was typeset with a high quality typewriter and is full of half-tone-like illos (including one of the designer on vacation). The writing style is pretentious, perhaps the most pretentious style I’ve ever seen in an RPG. The author never says anything in a few words and is fond of slightly different names for things that he never abbreviates; for example, Role Assumption Simulation Game (for RPG) and Game Operator (for GM). For an example of the writing style, here is the Introduction. The entire game is written in this style! All 160 pages of it. The LEGACY game is a second generation role assumption simulation which incorporates much that has been learned by users of role assumption games during the last four years. Many of the concepts and rules contained within the LEGACY game system are sophisticated compared to those included in other commercially available role assumption games, yet they are contained in a logically structured and internally consistent format which allows players to use information they already possess to aid them in locating rules and procedures and resolving game situations. Because the LEGACY rules attempt to simulate reality in a holistic manner incorporating many currently accepted principles of Biology, Geology, Chemistry, Physics, and Astronomy, the existing body of information available in reference and other sources may be used in conjunction with or to expand the LEGACY rules upon need. The underlying principle of the LEGACY game is the capability to create a logical and internally consistent environment within which a player or players may interact with a variety of components to cause one or more interesting or educational experiences. Unlike many other role assumption games this is accomplished by simulating the entire environment and leaving the player free to choose from a variety of courses of action limited primarily by the players own ability to perceive and interact with his or her environment. In other role assumption games the options or courses of action open to a player at any given time are limited by the available rules or preparations made by the game operator, while the LEGACY game has been specifically designed to allow the players a virtually unlimited number of options and the game operator the capability to expand the rules and preparations as needed, without significantly interrupting the course of play. This is accomplished through the availability of a hierarchy of scale levels on which the action of the game may be resolved and the provision for new rules and procedures built in to the existing portions of the LEGACY rules. The variety of environments and situations which the LEGACY game system attempts to simulate is substantially greater than any of the existing commercially available role assumption games, yet the number of environments for which specific information is contained within this rules booklet is smaller than that which is offered by some of the commercially available role assumption games. This is primarily due to lack of space within this booklet, but careful instructions are included allowing the user to “load” the game with rules and information sufficient to create an independent environment or situation. Many of the rules included in commercially available role assumption games such as; magic, psychic ability, large scale combat, warfare, naval combat, fantastic mutation, and cultural conflict are not included in the LEGACY rules to allow a complete coverage of the topics which are included within this booklet. Should rules covering those areas mentioned above be needed in order to resolve a situation arising from the play of the LEGACY game other games and simulations, role assumption or otherwise, may be adapted for use in conjunction with the LEGACY game system. A discussion of who this may be accomplished is included in the GAME OPERATOR’S SECTION of this booklet. The overall effect of the LEGACY rules is the capability to establish a simulated reality of variable characteristics in which individuals or groups may act out their fantasies, perform experiments, or participate in adventures of their own devising. I’ve seen Legacy compared to F.A.T.A.L., but I think that is an unfair comparison, both are awful RPGs, but Legacy is at least interesting with bizarre subsystems that just don’t quite work but seem like they could be useful if they did. For example, “Intentionality” is a way of determining what NPCs will do. It looks like a great idea, especially for what are now called sandbox campaigns. Unfortunately, it is not clearly explained or well-implemented. However, my friends and I spend a great deal of time and effort trying to make it work because it seemed like such an interesting idea. There’s little or nothing in F.A.T.A.L. like that — and Legacy lacks all the sexual stuff that seems to have drawn attention to F.A.T.A.L. I can’t do this Legacy justice in this short post. There is just too much weird stuff packed in its pages. Fortunately, I discovered an entire thread from 2007 on Legacy over on RPG.net: Legacy, the worst game every written? or the least the unintentionally funniest!. It’s well worth reading as the thread is full of quotes from the book and posts are often funny. i'm a collector of old-school fantasy rpg's. Particularly the most bizarre and obscure ones. I would love so much to have it! do you know if it is available somewhere as a pdf to buy?